Filip Conic outlines the market-access approaches and commercial strategies to unlock the growth potential in the Southeastern and Eastern European region. Southeastern and Eastern Europe is often thought of as a single homogenous region of debt-saddled healthcare systems, poor funding and interventionist payer policies. In reality however, the region comprises heterogeneous markets and an individualized approach is needed to assess their attractiveness and to seize commercial opportunity for a novel drug or medical device. 1) To what extent is the market attractive for the underlying technology? 2) How to commercially serve these markets? This article aims to display some of the heterogeneity across the Southeastern and Eastern European markets and provides a guidelines for commercial strategies facilitating product launches in this region. To what extent is the market attractive for the underlying technology? The growth prospects in Southeastern and Eastern European (SE&EE) countries are promising. However, there is a considerable spread in market attractiveness, which will likely continue to widen as countries start to develop individual paths. Given the growing divergence in economic and regulatory developments, manufacturers can no longer apply uniform products roll-out strategies country by country. Henceforth, a more differentiated approach is needed. SE&EE markets may appear attractive or unattractive based on any number of simple macroeconomic or healthcare statistics. For instance, drawing from GDP development, SE&EE economies can be clustered into stagnating (e.g., Croatia, Serbia, Slovenia), moderately growing (e.g., Bulgaria, Russia) and fast-growing markets (e.g., Romania, Turkey). 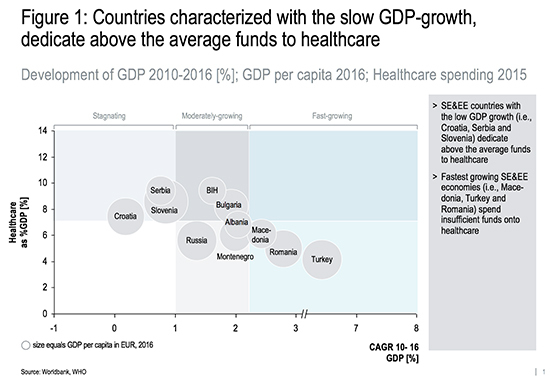 Taking into account country's healthcare spending, it seems that countries characterized with slow GDP growth dedicate above average funds to healthcare. On contrary, the largest SE&EE economies (e.g., Russia, Turkey) bear a considerable catch-up potential, as their healthcare systems are clearly underfinanced. As shown in Figure 1, conclusions drawn upon single-metric snapshots can often dilute actual market attractiveness. Therefore, companies must employ multi-dimensional indicators and understand evolutionary trajectories of individual countries in order to properly assess market attractiveness for the underlying technology. One of the key determinants manufacturers should consider in their go-to market strategies is the local payer structure, particularly public-versus-private systems, as well as the potential for out-of-pocket (OOP) payments in case existing structures do not absorb the costs. As outlined in Figure 2, SE&EE countries can be broadly clustered into "cash", "hybrid", and "reimbursement" driven markets depending on who the actual payer is and how the funding works. In reimbursement markets, compulsory health insurance theoretically guarantees universal coverage of healthcare services for the insured population. In cash-driven and hybrid markets, manufacturers typically rely on patients paying OOP for a number of years following launch before potentially achieving reimbursement for their products. However, regardless of the market type, in our experience in SE&EE markets we often observe that the actual coverage is subject to significant ambiguities such as inadequate infrastructure, waiting lists, and the benefit package being largely limited to off-patent drugs and routine diagnostics, while more specialized medical services are typically not covered. Paradoxically, in many SE&EE markets, private healthcare providers are not well integrated with existing public schemes and, hence, patients are mostly paying OOP, while only few will buy-and-bill to their voluntary health insurances (VHI). VHI is still underdeveloped in most of the examined pharmerging countries, with the utilization rate typically being in the lower one-digit percentage of total insured population. 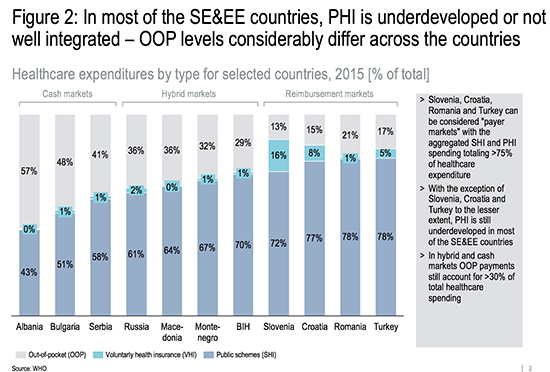 Following Slovenian and partly Croatian footsteps, neighboring SE&EE governments increasingly see opportunities to restructure funding of certain big-ticket healthcare costs by reducing medical services financed by compulsory health insurance and by actively promoting the role of VHI to cover the costs of additional non-basic medical services (see Figure 3). Understanding how the VHI will be utilized and how private healthcare providers will be integrated with existing public schemes will be of key importance given that manufacturers may increasingly need to deal with an entirely new set of payers and decision makers in SE&EE countries. SE&EE markets also present various funding sources for medical procedures. While providers mainly receive a fee-for-service for outpatient services, in the inpatient setting not all SE&EE markets have made the switch to the diagnosis-related group (DRG) structures that have become standard in Western Europe. Some markets, such as Croatia and Slovenia, have already done so, while others still depend on strained local hospital budgets to fund expensive procedures not covered by a DRG. Under a DRG-like system, it is important to understand likely coding for procedures, their funding level, and the potential for change. On the contrary, if the norm is for hospitals to fund from their own global budgets, manufacturers will need to consider whether there are opportunities for extra funding. Finally, manufacturers should be mindful of varying stages of EU accession of the SE&EE countries and associated legal requirements. EU accession has paved the road for the free trade between EU member states, but for some new and particularly EU candidate countries the administrative burden still remains. The evolving legal environment will necessitate from manufacturers to re-assess their route to market models in SE&EE in the future. How to commercially serve the SE&EE markets? Once the market’s attractiveness is assessed, manufacturers need to secure marketing authorization (it should not be forgotten that centralized marketing authorization does not apply in a number of SE&EE markets; local authorities have jurisdiction over it), manage funding and market access, optimize supply, and define the optimal go-to-market models. Given the diversified payer structure across the SE&EE markets, manufacturers should apply approaches tailored to the market archetype to secure market access. In reimbursement-driven markets, manufacturers should explore opportunities to expand the actual funding. For example, while funding even in SE&EE's most developed countries is largely limited to hemodialysis (HD), manufacturers would do well to devote sufficient resources exploring potential for creating a new home hemodialysis (HHD) tariff or whether different HD tariffs (e.g., CHD, IHDF) could also partly apply to HHD. In hybrid and especially in cash markets, manufacturers should work jointly with local payers seeking "innovative ways" to share the cost and thus enable funding of novel technologies. For example, patient access schemes are gaining a momentum across SE&EE. Performance-driven schemes such as those for Perjeta (pertuzumab) in Croatia or Sovaldi (sofosbuvir) in Romania, for example, have potential to accelerate access and hence, are perceived as win-win-win deals for patients, payers, and producers. With regulators having done their homework, now it is up to manufacturers' local capabilities to explore these new, innovative avenues in securing access in SE&EE. Once in the market, products often do not reach designated patients in low-priced SE&EE countries, but are parallel traded due to net price differences, which are caused by differing reimbursement mechanisms across Europe. Parallel trade is a legal and highly active business within the free trade zone of the EU, while imports from non-EU countries (e.g., Turkey) into the EU are illegal and repacking in an EU country sometimes occurs to distort product origin. So far, attempts by the EU countries to ban exports have been slashed by the Commission, but based on our experience in the SE&EE region, order-taking control based on patient forecasts, streamlining of distribution, and direct-to-hospital supply are important levers for companies assuring that certain drugs reach designated patients and thus to avoid drug shortages. Companies doing business in SE&EE are frequently trading-off whether to pursue a direct sales approach or to cooperate with a local partner. Partnering with distributors and wholesalers can be attributed to poor payment behavior of (public) authorities in SE&EE that are associated with prolonged payment deadlines often beyond 150–200 days. Moreover, joining forces with local partners is mainly related to limited capacities in labor and, especially, the cost of direct sales to many small entities. Unlike their Western counterparts, the pharmacy landscape in SE&EE markets is usually deregulated and chaining is widely employed. Only in fewer instances is grouping of pharmacies limited to a certain number of outlets (e.g., Bulgaria) or not allowed beyond public community networks (e.g., Slovenia). With the concentrated ownership structure in the retail segment, manufacturers experience difficulty because of increased negotiation power on the demand side. Being backed by an intermediator can help companies to buffer the price pressure or to diversify risk by targeting the outlets beyond large pharmacy networks. Also, the online/mail-order channel should not be neglected, since the legislation regarding internet sales is often more relaxed in SE&EE countries compared to the West. Lastly, we witnessed that SE&EE countries are implementing significant changes on the procurement side with regard to centralized tenders. At first glance, the tender issuing process might look similar across different markets. Despite similarities in the overall process, tender management is often complex, as SE&EE countries exhibit distinctive tender characteristics with often rigid specifications with regard to tender scope, terms and weighting of criteria. To address such market-specific variations, there is an argument to combine direct sales and collaborate with local partners. For instance, external tender providers can provide administrative support, while manufacturer sales teams can fully focus on targeting key decision makers within the tendering authority. Selecting the appropriate local partner and striking the right balance between sales channels will help manufacturers maximize the gains. To unlock the growth potential in the SE&EE region driven by the steady market development, increasing funding opportunities, and gradual EU accession, the opportunities must be carefully assessed and prioritized, while the execution must be tailored to specificities of local markets. Defining the right market access approach and successful commercial strategies can accelerate sales from the pan-European perspective. The main challenge is defining a way to capture the full potential of the SE&EE region while considering, but not getting lost, in the individual differences.